Secondhand Smoke in Condos. Coops & Apartment Buildings. Those who claim you have no rights are wrong. Secondhand Smoke in Condominiums, Co-ops & Apartment Buildings: Chain-smoking abusers and their defenders believe you’re helpless – that you can’t protect yourself and loved ones from toxic secondhand smoke fumes that enter your home and/or saturate common area corridors. They’re wrong! This book gives you the strength to fight back. A leading attorney is using this work in his university law class. SECONDHAND SMOKE CRIMES is a wake-up call for condo boards, co-op boards and property managers who protect the rights of chain-smokers over your right to a smoke-free home. Chain-smokers are addicts. Addicts care little about the feelings or rights of others when they “must have” their fix. Just as they blacken their own lungs, hearts and teeth, they also destroy your DNA. That’s right – your DNA!!! The author explodes the myth that chain-smokers can do as they please in condos and multifamily buildings. She champions your right to clean indoor air. Law makers and state legislatures are challenged to protect babies, children and non-smoking adults where they can least defend themselves – in multifamily buildings. Do not accept victimization. Don’t allow chain-smoking bullies to destroy your health and happiness.Learn about a condo mom who won a landmark secondhand smoke case and how she did it. Read about condo board bullies who are singing a different tune today. Education works! If you know a chain-smoker who needs a wake-up call, send this book. 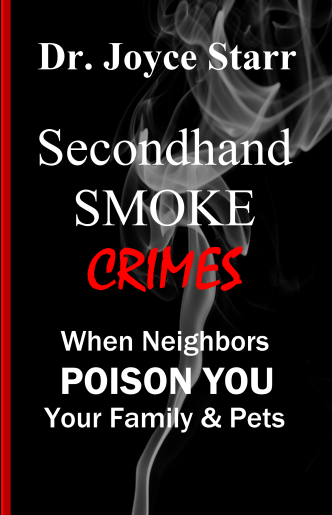 Secondhand Smoke Crimes, When Neighbors Poison You, Your Family & Pets, is a must read for anyone living in a condo, apartment building, town-home or duplex. You may feel you have control over your home’s environment, but what happens if you live next door to someone who smokes, plays loud music or does something else that is bothersome to you and your family? What are your rights? What can you really do about the situation? These are the tough questions and situations that your landlord or homeowner’s association may be faced with if you file a complaint. What happens though if YOU are deemed the problem? That’s where Secondhand Smoke Crimes, When Neighbors Poison You, Your Family & Pets becomes an important tool in your life. Finally, someone speaks out! This book is a great resource for the silent majority of people who are sick and tired of being sick and tired! Not only does it afford you the tools to deal with an off site management or HOA, but outlines how to find out what rights you have in place to protect your well-being. I have lived 8 years in a situation that has been an on-again off-again nightmare of dealing with abuse of HOA covenants (no smoking in common areas, hallways, etc.) and without this book I’d still be trying to have these issues addressed. Dr. Starr has given voice to so many homeowners rights issues, its about time this was brought to light! – Rachel – Amazon Review. Secondhand Smoke Crimes is one of those rare, ground-breaking, technically important and yet readable books that arises from a serious personal experience. Almost everyone has been or is annoyed by secondhand smoke at one time or another but few of us realize how dangerous even brief exposure to secondhand smoke can be or what can be done about it. The author, Dr. Joyce Starr, documents the medical dangers and lays out a practical approach for dealing with the problem, not only in general but particularly within the context of a condominium community. Ideally, of course, no one would smoke — not just because it’s a slow form of suicide but also because it hurts others. Alas, most smokers are neither sufficiently self-protective nor altruistic. I certainly wasn’t until medical reasons forced me to give up smoking. Secondhand Smoke Crimes shows how one can deal with the perils of secondhand smoke if one can’t avoid it/move away, the smoker(s) won’t stop voluntarily and those responsible for enforcing no smoking rules won’t act. Tempting though it may be, you can’t simply shoot the miscreants even though it’s clearly self-defense. That won’t assure a favorable outcome if only because you’re abating the nuisance of smoke with other nuisances, noise and littering. Nor, strangely enough, will seeking legal assistance in the form of an injunction or suing for damages. Why? Law firms are reluctant to take such cases as the law is vague, the remedies slow and dubious, and easier cases usually are more profitable. BUT, as the author shows you can buck those odds, IF you take the trouble to assemble the relevant laws and legal precedents, describe the situation calmly and clear in ordinary English and then find an aggressive law firm interested in distinguishing itself by pioneering a new specialty practice. Having done this, the author suddenly discovered that what initially was an personal health risk has become a public service to her friends, community, the legal profession, and the body of literature called personal success / self-help stories.